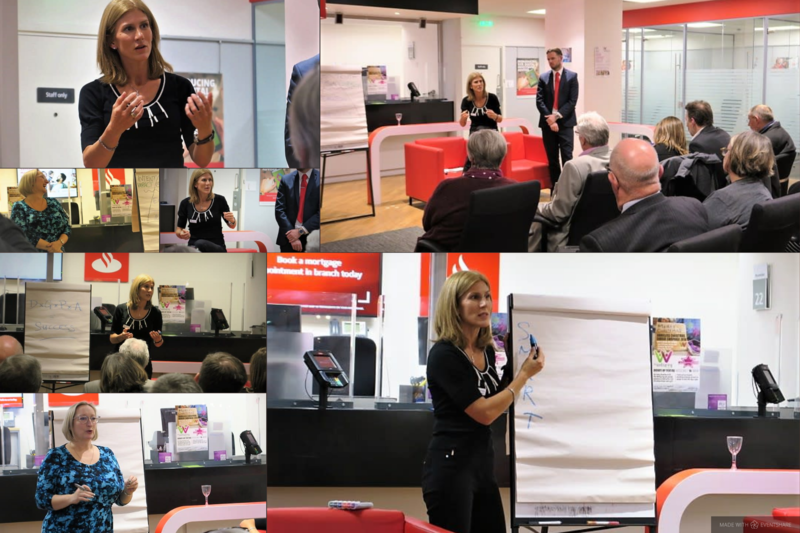 Last week Sarah took part in a local Stockport business event hosted by the team at Santander, where the theme was all about setting 2019 up for success. Sarah delivered an engaging and inspiring keynote on her Formula for Success to make 2019 your best year yet, which was followed by Hazel Carter-Showell’s of Carter Corson Business Psychologists highly entertaining and equally inspirational talk on how developing your skills in Conducting Difficult Conversations would help you drive growth and change through 2019. The event was well attended by local business leaders despite it being a cold and wet late November evening, and nourishment was provided by the team at Pepper Cafe and Catering, and Stockport’s newest cake and sweet treat business, The Sweetest Favour. Audience participation was excellent and the Q&A covered topics ranging from the impact of technology and artificial intelligence, to bottom up leadership and harnessing the skills and interests of the youth of today to support your business aspirations. Your goals keep you on track to reach your dreams. Goals should be long, mid and short term to ensure momentum in the right direction. Goals should also be SMART: Specific, Measurable, Achievable, Relevant and Time Bound. And they should have related KPIS (Key Performance Indicators), which should also be relevant, timely and accurate. We all know what gets measured gets managed, and therefore gets results, so what are the critical things you should be measuring en route to your goals and dreams? A plan makes things happen. Many people say they are too busy to plan, but without a clear proactive plan in place we default into allowing our days and weeks to run us rather than the other way round. We chunk our goals down and work to 90 day plans – 13 weeks, one season, a quarter of the year. It’s a time frame which you can see through to the end and hold focus. Everything in your plan is a stepping stone towards you achieving your goals and dreams. In our experience people generally overestimate what they can achieve in one year, but vastly underestimate what they can achieve in 5 years if they just stay on track – the compound effect of little actions taken consistently every single day is incredible. We will be running a half day Quarterly Planning workshop on 11 January for any business who may be interested in attending and setting their sights on success in 2019 – more on that to follow, but do contact us if you are interested in finding out more. Because without action, the rest is just fluff! As Mark Twain said “Actions speak louder than words”, but not nearly so often!! If you have done everything above, taking massive action should be simple. That doesn’t necessarily mean it’s easy – there are always a lot of of things which can get in your way, but the very worst mistake we can make is not getting started.